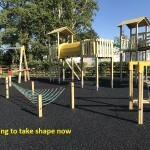 We are currently in the process of having a brand new children’s play park installed at the front of the park here at Cottage and Glendale Holiday Park. This is a significant investment into the parks facilities for the younger families and those with grandchildren or friends with children who may come to visit. 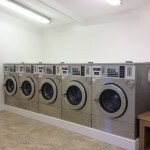 Our Laundrette facility is open every day offering five washing machines and four dryers for all your laundry needs. Whilst you’re waiting for your washing or drying to be done, why not sit back and relax with a drink from our vending machine, watch the television or read one of our complimentary newspapers or magazines. 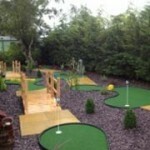 Our fantastic new mini golf course offers hours of fun for kids and grown ups of all ages. With a golf club and ball hire facility you don’t have to worry about bringing your own. Our fantastic new tennis court offers hours of fun for kids and grown ups of all ages. 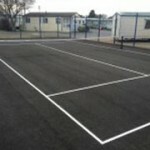 With a racket and ball hire hire facility you don’t have to worry about bringing your own. Don’t worry all the line markings will be done in time for Wimbledon! 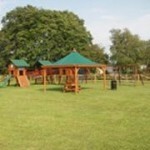 Our children’s adventure play park offers hours of play value to children of all ages! 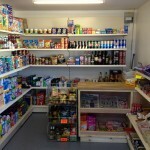 Whether it’s making a meal or for your daily essentials our on-site Village Store will cater for your needs. We stock everything from fresh fruit and vegetables to fresh milk, eggs and you can even order your daily newspaper. The machines here in our personal gymnasium are suitable for everyone. We have a range of cardiovascular machines including treadmill, cross-trainer and exercise bike which are designed to enhance all around fitness, as well as machines to strengthen and tone muscles in your arms, chest, shoulders, back and legs. We also have exercise mats, stability balls and abdominal cradles to tone stomach muscles. 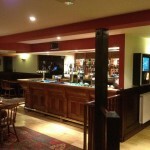 The beautiful Lakeside Bar & Bistro offers a relaxed and informal atmosphere for all the family, providing a range of homemade meals within an extensive menu and additionally catering especially for children. The Sunday carvery is a popular addition within the Bistro and ideal for visiting families to gather together over a traditional Sunday Lunch. 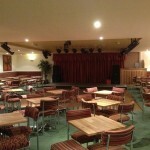 The Lakeside Lounge has benefitted from a major refurbishment and provides the perfect venue for a fantastically varied entertainment programme including kids clubs, karaokes and exclusive famous sports star nights, not forgetting the fabulous live entertainment which runs every weekend including visiting cabaret from all over the UK. Such acts include singers, duets, groups, bands, comedy acts, magicians and even a hypnotist!